Asten > I have noticed the lack of blogging content about Nilo-Saharan and Nilo Saharan speakers. The background of my conclusion starts somewhat like this - Initially I had been reading a lot about E1b1~ lineages. I focused on the ancestral lineages in East Africa, this lead me to study the dna of East African Afroasiatic speakers. Much of these topics peaked with the publications by Cruciani and Tishkoff. In studying Horn African groups there is a noticeable trend indicating their languages Cushitic/Omotic have a more northern source as Proto-AA is supposed to have coalesced somewhere around the Sudanese/Egyptian Red Sea coast. Also some of the most important Male lineages : E-M78 and its V32 and V22 subclades are thought to have back-migrated from this general area. These facts then led me to study more on Egypt. As we know Egypt has a wealth of physical remains and culture to study. 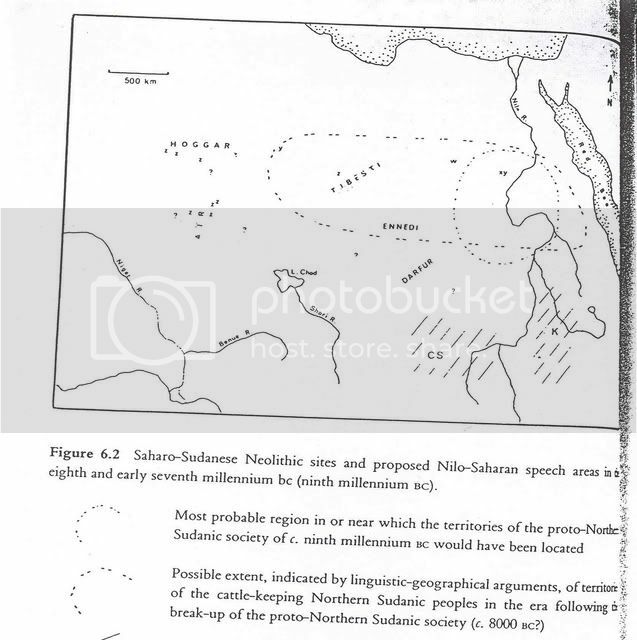 One thing I noticed though, when studying Nile Valley topics is some of the data, particularlry the early data in both Sudan and Egypt led not to Afrasians but to Nilo-Saharan speakers. Marnie > It's odd that there is not more follow up on the Cruciani and Tishkoff papers regarding Nilo-Saharans. There have been a number of very good genetic papers in the last few years on West Africa. Ethiopian groups, including a few Nilo-Sahara speakers, were covered in the June paper on Ethiopian genetic diversity (link). There is also an interesting recent paper on the Maasai (link). Many of the papers on Africa of the last year or so have focused on the ultra hot topic of human origins (link) and in so doing, have studied the San, Hadza and Sandawe. However, to my knowledge, there has not been a paper to specifically follow up on the Nilo-Saharan studies of the 2009 Tishkoff paper "The genetic structure and history of Africans and African Americans" (link). Marnie > Note that there is a difference in the Ehret and Blench maps. However, recent research is beginning to support the Ehret map. 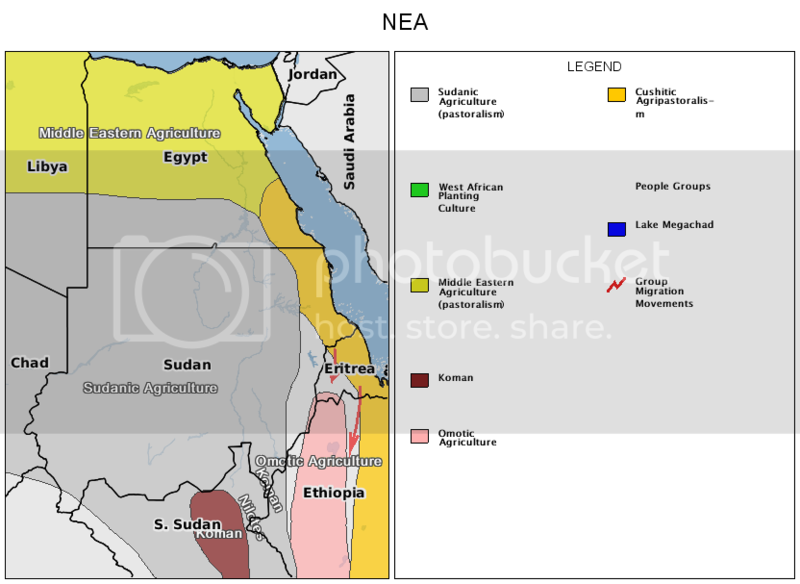 Asten > When on the topic of cattle domestication, I notice again most publications seemed to hint at this being the ancient practice of Nilo-Saharan speakers both in the Nile Valley, the Sahara as well as the western Deserts of Egypt. Some authors say the pysical remains of the population should be identified as some type of Proto-Nilotic or Nilo-Saharans. Many sites of cattle early domestication (and early pottery) are at the same latitude as Southern and Middle Egypt. I don't know what this says as far as Origin but I do think this should be more taken into consideration as far as commenting on the historical distribution. Marnie > There is a lot of evidence that Southern Egypt during the Holocene Climatic Optimum was populated by Nilo-Saharan speakers or perhaps by both Nilo-Saharan speakers and Cushitic/Omotic speakers. The work of Christopher Ehret does point to the presence of Nilo-Saharans at the southern edge of Egypt. The work of Tishkoff et al (link) indicates a long pattern of intermarriage between some Cushitic/Omotic speakers with Nilo-Saharans. If you look at the rock art of Karkur Tahl, in the dessert at the very southwestern edge of Egypt, you see drawings of people who share characteristics, hunting styles, weapons and dress with groups who today live further south and are both Nilo-Saharan and Cushitic/Omotic speakers. The linguistic evidence also supports the notion that proto-Nilo-Saharans and/or proto-Cushitic/Omotic speakers crossed into Southern Egypt during the Holocene Climatic Optimum (link). The definitive answer as to whether the occupants of sites such as Karkur Tahl were proto-Nilo Saharan and/or proto-Cushitic/Omotic speakers remains an open question. Marnie > As far as fringe theories go, there has been much opposition to the work of Chris Ehret, some of which has been discussed on this blog. Here, for instance. However, in spite of the objections to his work, Ehret's linguistic research has been supported by the Tishkoff genetic research and by recent rock art finds at Karkur Tahl . . . fringe theorists notwithstanding. Marnie > I'm not familiar with this study, but I will have a look. Marnie > Asten, thanks very much for the links to these stunning papers on the genetics of the Egyptian Amarna Pharaohs. Hopefully, there will be more research soon to unravel the identity of the innovative and courageous peoples who pushed into the Sahara as the first rains began to fall over 10,000 years ago. The Nilo-Saharans, venturing forth from their stronghold near Atbara, were surely one group of these intrepid people. Update (October 16th, 2012): In this discussion about Nilo-Saharan genetics, it should be pointed out that the Dinka, a Nilo-Saharan people who today live in the Bahr el Ghazal region of South Sudan, were included as a population in the recent paper "The genetic prehistory of southern Africa", Pickrell et al (link). 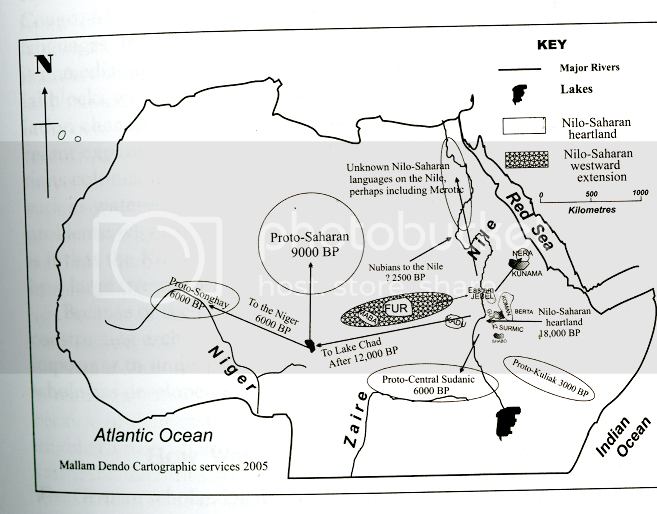 The Dinka are a Nilo-Saharan people and are shown in this paper on the Treemix diagram, Figure 3. This Treemix diagram supports the hypothesis of some linguists that the Dinka, as a proxy for Nilo-Saharans, have as their close relative, the Yorubans (a proxy for most West Africans.) No doubt, the Pickrell team will soon have a closer look at the relationship between West Africans and Nilo-Saharans, and also, the possible associations between these two groups to Eurasians, North Africans and other East African groups.